Have you ever felt the strong urge to go on vacation? Have you ever wanted to see new places and experience new things? Troy’s Travel Corner is a blog dedicated to giving you a taste of the different countries around the world to inspire your next vacation. For the first edition, we will be traveling to Greece! Welcome to a new blog called Troy’s Travel Corner. Each installment will highlight a wonderful place in the world to travel to. Not every place will be to someone’s liking, but hopefully you’ll learn a little something interesting about each area. So to start this installment, let’s take a chariot ride to Greece! Greece is a beautiful country to visit. With bright blue waters, deep rich history, and mouthwatering food! There’s something for everyone in Greece! To start your travel, I recommend you head down to Santorini and check out the lovely ocean view! This is a popular tourist spot, and it is photographed quite a lot. 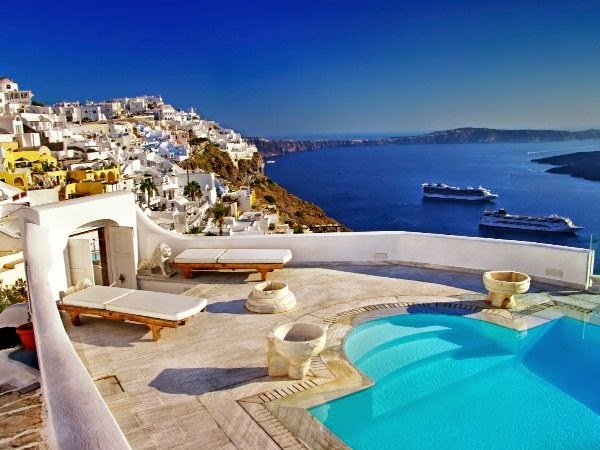 Santorini is the perfect place to lay down, relax, and get a nice tan! Next, let’s take a spin to Athens! Athens is the capital of Greece, and is where a lot of major monuments are located, such as: the Parthenon, and the Acropolis of Athens. I definitely recommend Athens for any history buff! While you’re in Greece don’t forget to make a stop at some local restaurants. Greece has so many delicious Mediterranean foods to offer. From Gyro to Gigandes plaki to Tiropita, good luck trying to choose at dinner time! Of course Greece has much more to offer! But I hope this blog has given you a little taste of this beautiful country. If you have any suggestion as to where we should travel to next, leave them in the comments below! Alec Stanford Greece :D my favorite country. Its true, Athens is so more beautiful in life than in picture! Good article! Ivy Winters Lovely blog Lea! Greece is a wonderful place!